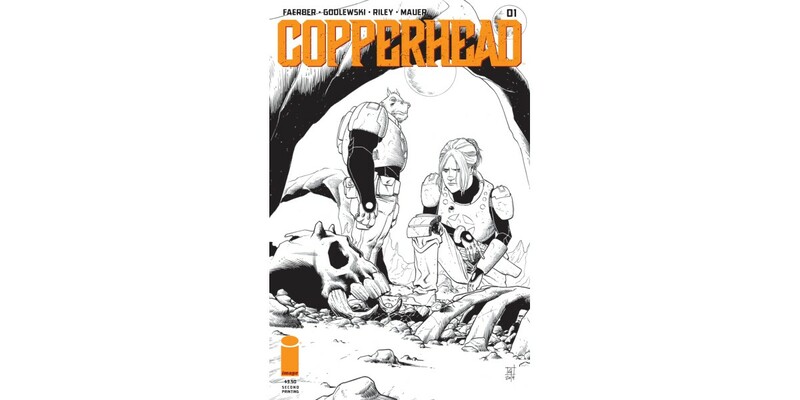 Writer Jay Faerber (NEAR DEATH, DYNAMO 5), artist Scott Godlewski (Dracula: The Company of Monsters), colorist Ron Riley (NEAR DEATH, DYNAMO 5), and letterer/designer Thomas Mauer (UNDERTOW, UMBRAL) have won the hearts of readers with their new science fiction western series COPPERHEAD. Issue #1 has sold out completely and is being fast-tracked to a second printing to meet customer demand. "Scott, Ron, Thomas and I are blown away by the response Copperhead's gotten,” said Faerber. “We've been having a ton of fun in the mining town of Copperhead, and we're thrilled people are responding to it. The ride is just beginning!" In COPPERHEAD #1 readers meet Clara Bronson, a single mother who takes the position as new sheriff in Copperhead, a small mining town on a distant planet. But while Clara might seem like an ordinary lady in all respects, she has one or two secrets she’s hiding… and secrets don’t last long in a small town like Copperhead. COPPERHEAD #1 has completely sold out at the distributor level, but may still be available in comic stores. It is currently available digitally on the Image Comics website (imagecomics.com) and the official Image Comics iOS app, as well as on Comixology on the web (comixology.com), iOS, Android, and Google Play. Image Comics is pleased to announce that this first issue will be going back to print to meet customer demand. The second printing of COPPERHEAD #1 (Diamond Code AUG148041) will release on 10/8. COPPERHEAD #2 releases 10/8 as well and will be available for pre-order with Diamond Code JUN148095.